What is a Special Road? Yeah, yeah, yeah. Bear with me, OK? Let's go through first what the vast majority of roads in the United Kingdom are. When you build a new road, or improve one that's been there for many years, by default they are a right-of-way. In other words, anyone can travel down them. Of course, you can restrict who goes where with a traffic order, but the fundamental truth is that anyone can use that road, unless they are specifically restricted from doing so. Utility companies are allowed to put items under them, so gas pipes, electricity cables and sewer pipes are all allowed to be underneath the road, and the companies can dig up the road for repairs as necessary. Ordinary roads are known as "all-purpose roads", for obvious reasons. With a Special Road, it's exactly the opposite. On a Special Road, nobody is allowed to access the road unless otherwise specifically allowed. Utility companies aren't allowed to dig them up, and services cannot be provided via them. Ah, I see. I think. 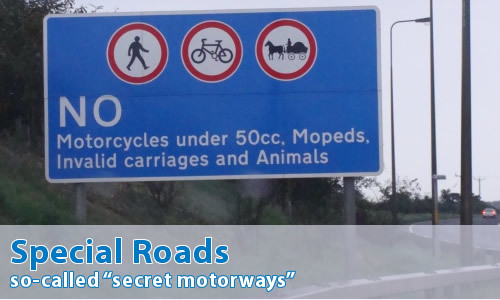 Well, I'm sure you're very familiar with a term that's commonly used as a replacement for Special Roads - Motorways. Oh right, yes. So Special Roads are Motorways, right? Should we go back to the beginning then? What Special Roads are there?